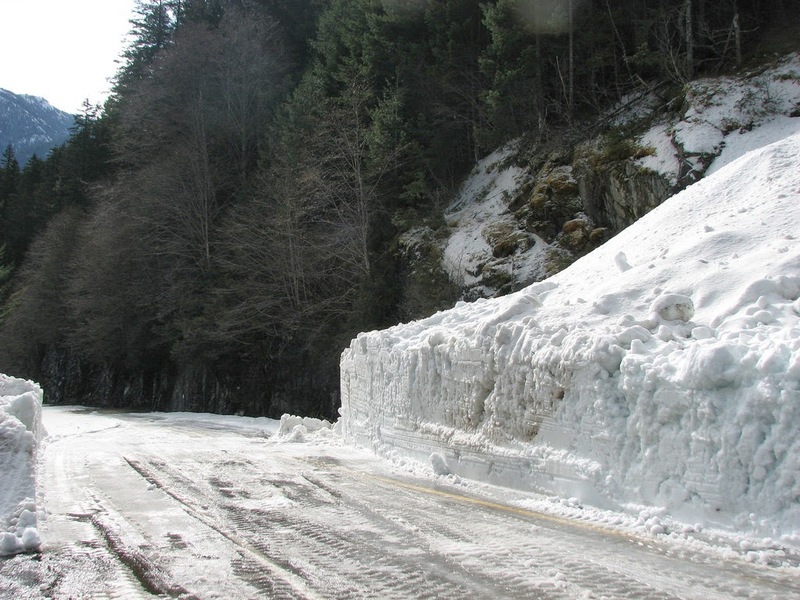 Clearing work began this week to open State Route 20 - North Cascades Highway. Snow blower clearing nearly a foot of snow from the west side of SR 20 at Diablo Gate. Maintenance techs from Twisp set off Monday, March 31, to start blowing and pushing snow from the closure barricades at the Early Winters Information Center up to the Silver Star Gate. That’s a seven-mile stretch on the east side of SR 20. Crews had cleared two snow blower widths of snow from between those mileposts by Tuesday evening. Clearing work begins today on the shoulders and pullouts throughout that area in addition to the parking and turnaround space at the Silver Star Gate. In years past, maintenance techs start the clearing process on either side of the pass. An avalanche control team member joins the process once the crew reaches the Cutthroat Ridge avalanche zone to watch for avalanche activity. That person is essentially a spotter for those clearing the highway. Crews discovered during their assessment last month that Delancey Ridge avalanche zone had come in with snow and debris reaching the road – a first in recent memory for our clearing team. With that much snow, maintenance crews need their spotter early. They’ll be joined by a member of the avalanche crew on Monday, April 7. Work on the west side began Tuesday, April 1, once maintenance technician Bob Hopfield took control of his usual spring “ride” – a loader-mounted snow blower – at Diablo Gate. Ridge snow slide clearing process. Before he arrived at SR 20, Hopfield had been assisting State Route 530 slide emergency response operations along with many others from WSDOT. The snow depth at Diablo Gate has melted down to less than a foot deep. Further up the highway, the snow is nearly two-feet-deep. The Ruby Ridge avalanche zone has been active as well, with chute #10 covering both lanes of SR 20 with a dozen feet of snow. This is a relatively small slide. By the end of Tuesday, the crew had cleared a single lane all the way to milepost 144, just before East Creek Trail. Next up is widening the cleared area and tackling the clean-up of the Ruby Ridge avalanche zone slide. of SR 20 at the Ruby Ridge slide. Late snow meant a late start to snowmobile season this year. 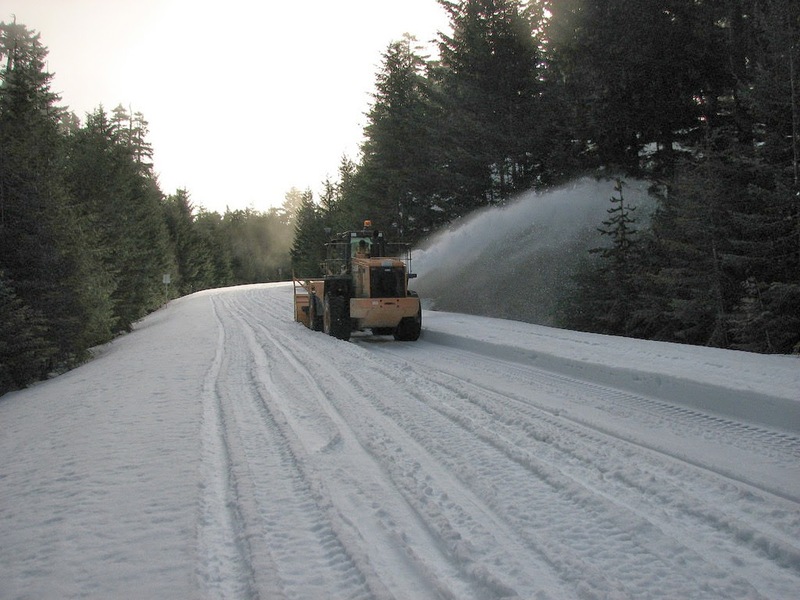 The west side clearing team is leaving snow on the westbound SR 20 lanes from the gate to Granite Creek for up to two extra weeks to give snowmobilers more time on the snow. The beginning of westbound lane clearing and ditching work will mark the end of snowmobile season from the west. In the meantime, crews are clearing and widening only the eastbound lanes for the 14 miles up to Granite Creek. For the latest SR 20 – North Cascades Highway news, visit our website or sign up for email updates. See even more SR 20 clearing photos on Flickr. 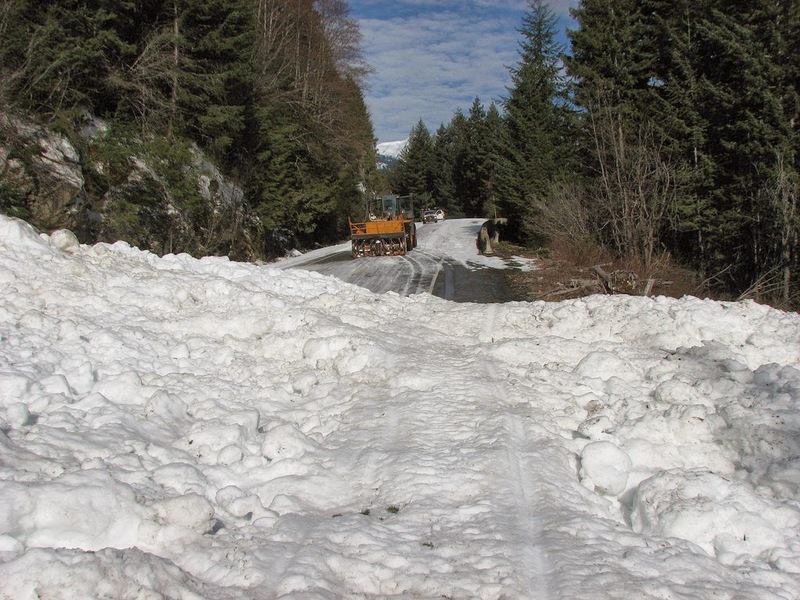 This entry was posted on Wednesday, April 2, 2014 at 4:29 PM and is filed under North Cascades Highway, North Cascades pass snow, north cascades pass snow removal, SR 20, Washington Pass. You can follow any responses to this entry through the RSS 2.0. You can leave a response.